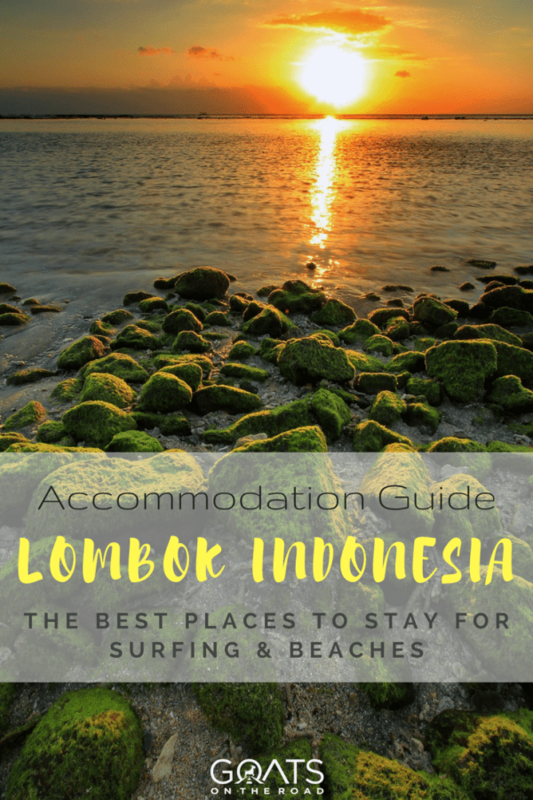 This guide to where to stay in Lombok will show you all the best areas of the island, including the best surf spots and the best local villages. Plus, we’ll breakdown the top-rated budget, mid-range and luxury hotels on the island. 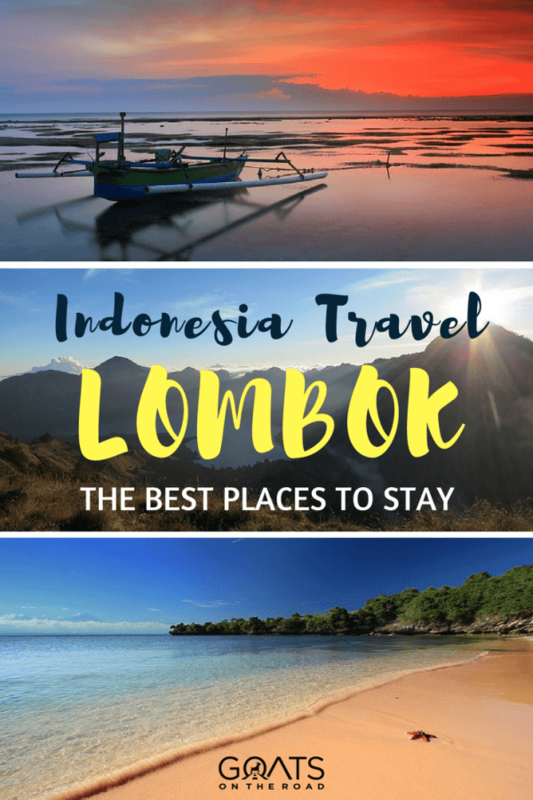 The goal of this post is to help you find out where to stay in Lombok and which areas, hotels and beaches will suit you best. Lombok was one of our favourite Islands in all of Indonesia and we’ve spent 2 months living in Canggu Bali and another 2 months travelling around Indonesia… so that says a lot! 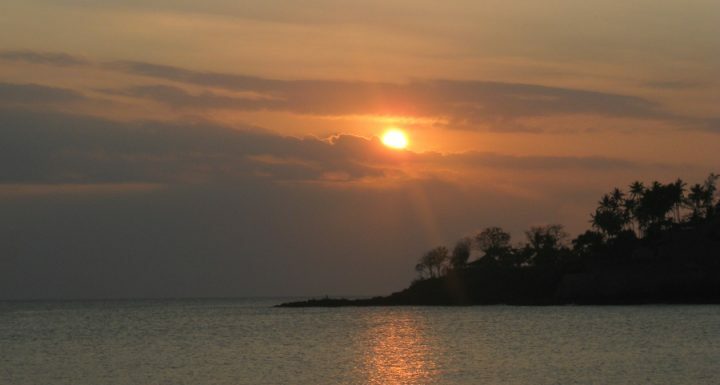 There are numerous towns and beach villages around Lombok, so figuring out where to stay in Lombok isn’t always easy. 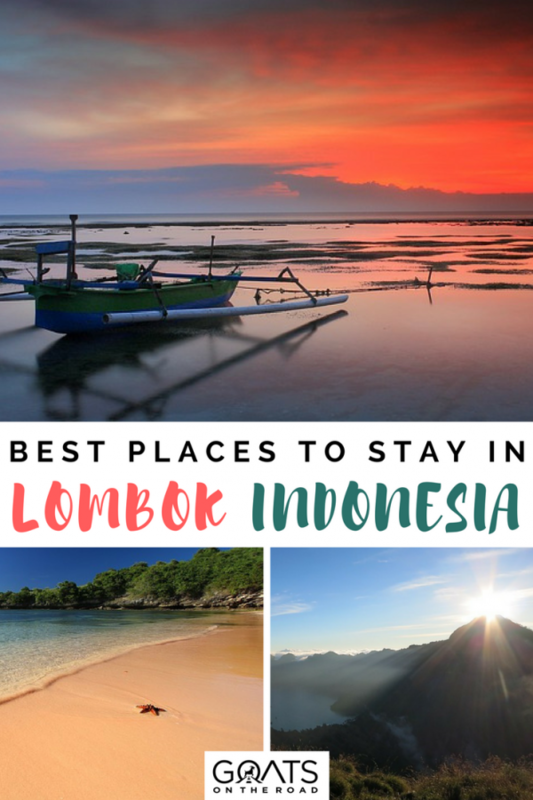 But, no matter where you choose to stay in Lombok, it’s likely that you won’t want to leave! Note: If you’re staying in Lombok, you may also want to check out the nearby Gili Islands! 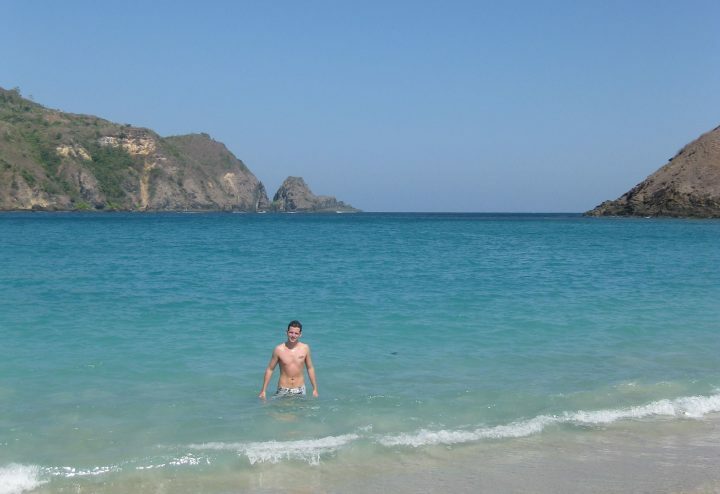 Kuta is where most people choose to stay in Lombok because if the spectacular scenery. There are jagged cliffs and mountains stretching out along the coast near Kuta that offer beautiful viewpoints over the sea. The beaches in and around Kuta are some of the best in the entire country, with powdery white sand and aquamarine waters. This is also where you’ll find some of the best surfing on the island and it’s very easy to get lessons and boat tours out to the best breaks. Click here to see available accommodations in Kuta, plus reviews and current pricing on Booking.com. This is the main tourist strip on the island. Lining a long stretch of black volcanic sand, there are countless guest houses, hotels and resorts along the beach. There are some good restaurants and bars in town as well. 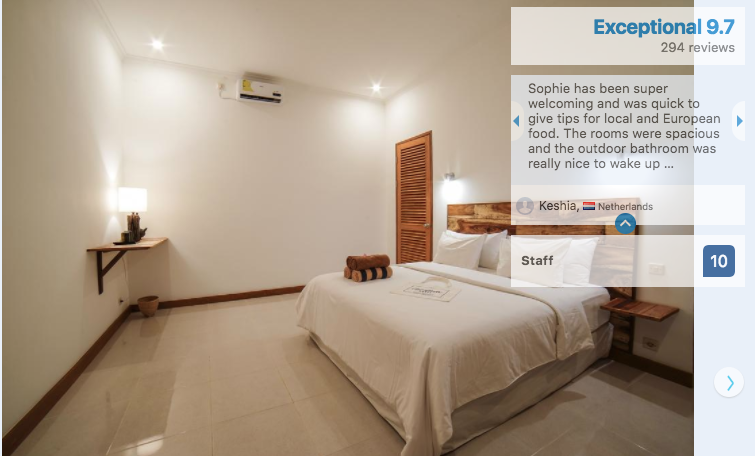 It’s worth noting that during high season (July – August) the accommodation can book up quite quickly in Senggigi so it’s worth booking ahead. This developing tourist destination is set on a beautiful natural harbour with a nice beach and numerous 5 star resorts. There’s also a golf club on the nearby Sire Peninsula and there is a marina here where you’ll see several sail boats and traditional Indonesian vessels as well. Few tourists head to Mataram, but if they do it’s generally to check out the numerous mosques, the Taman Mayura water palace and the nearby Narmada Park. If you’re looking to find local life on Lombok, you’ll find it in Mataram. There’s also a good variety of restaurants here as well as the cool strip of street stalls and warungs along Jalan Udayana street. When most people choose where to stay in Lombok, they typically go for Kuta or Senggigi, but if you’re looking to be in a local city, this might be the place for you. Without a doubt the best surf spots in Lombok are all around Kuta, but there are some other spots as well. If you’re trying to figure out where to stay in Lombok, and your decision is largely related to the best surfing spots on the island, then this part of the list should help you decide. This long, jagged bay is known as being one of the most consistent surf spots in Lombok, with some of the best swells you’ll find on the island. Gerupuk lies just 7 kilometers east of Kuta and the breaks here can only be reached by boat. It’s best to hire a boat and driver (and surf instructor if you’re a beginner) from Kuta. Most guest houses and hotels can arrange trips to Gerupuk Bay relatively easy, just tell them the day before. This is another beautiful break located just outside of Kuta to the west. Unlike Gerupuk, you can reach the breaks of Are Guling by boat and by land. This is probably the best right-hander break on the South Coast of Lombok and at mid and low tides there’s some nice barrels here that can be up to 10 feet high. This heavy reef break lies just 20 minutes west of Kuta and attracts more experienced surfers. With 10 foot drops along a deep left barrel, these waves are known to hold you down for a while. It’s best to come here at mid tides between May and September. Of course one of the main things you’ll be thinking about when figuring out where to stay in Lombok are the hotels and guest houses available. As Lombok grows to be one of the more popular tourist destinations in Indonesia, there are many new places to stay popping up each week. From budget to ultra-luxury, you’ll find a wide variety of places to stay in Lombok. You’ll probably want to stay near Kuta, and there are some amazing accommodations to choose from. Check out the highly rated Jivana Resort with rooms from $85/night, Pipe Dreams Villa Resort with rooms from $65/night, Villa Bau Nyale with rooms from $45, or Rasti Homestay with rooms from $15/night. Ibludan Hotel Kuta: This is one of the top rated hotels on Booking.com and has some beautiful bungalows very close to the water. The bungalows also have a fridge, stove and dishes so you can cook for yourself. The service is excellent and you really can’t beat the location. They can also help arrange surf trips to nearby bays. White Rose Guest House, Senggigi: This is the number 1 highest rated guest house in Senggigi and one of the best ones in Lombok. The guest house offers beautiful and bright air-conditioned rooms with individual terraces and garden views. Comfy beds and excellent value make this place a top choice for budget backpackers visiting Senggigi, who want some comfort at a good price. Now You Know Where To Stay in Lombok! If you’re trying to figure out where to stay in Lombok and you just can’t decide, maybe choose a few places and stay a bit longer than you expected. Most people who visit this tropical paradise end up falling in love and extending their stay anyways. You might as well book your hotel for longer than planned and check out a few locations. You can also rent a motorbike and drive around the island. This will help you to decide where to stay in Lombok after your first booking is complete. 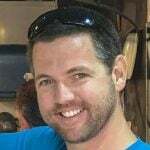 Thanks for sharing such an amazing article. After reading the article, I feel it this article definitely helps to stay in Lombok.